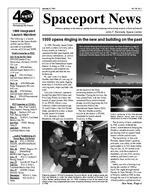 SPACEPORT NEWSJanuary 8, 1999 Page 2 Kennedy Space Center and the Spaceport Florida Authority (SFA) began construction of an $8 million Reusable Launch Vehicle (RLV) Support Complex at a groundbreaking ceremony near KSCs Space Shuttle Landing Facility (SLF) on Dec. 18. Plans for the complex, to be located on the tow-way at the south end of the Shuttle Landing Facility, include a multi-purpose reusable launch vehicle hangar and adjacent facilities for related ground support equipment and administrative and technical support. Intended to support the Space Shuttle, other reusable launch vehicles and X-vehicle systems, the new complex is jointly funded by Spaceport Florida Authority, NASAs Space Shuttle Program and Kennedy Space Center. A four-phased development plan promises completion of the complex by year 2000, in time to support KSC test flights of the X34 reusable launch vehicle technology demonstrator. NASA managers announced plans to bring the X-34 to KSC at the groundbreaking ceremony. The support complex may also support theBreaking new grou nd at KSCs Reusable Launch Vehicle Support Complexproposed VentureStar reusable launch vehicle. Phase One of this development plan includes the construction of a multipurpose hangar, explained Kennedy Space Center Director Roy Bridges. This groundbreaking not only starts the construction of a hangar, but it marks an important milestone in our joint effort with Florida to expand the world classJanuary employees of the month and the 1998 employees of the yearcapabilities at KSC. Spaceport Florida Authority was established in 1989 by Floridas governor and legislature to assist space-related enterprises statewide and to coordinate state government support to the space transportation industry. This project is a prerequisite to accommodating some of our nations nextgeneration space transportation systems and a perfect example of the kind of federal/state cooperation envisioned in the National Space Policy, said Spaceport Florida Authority Executive Director Ed OConnor. NASA and the Spaceport Florida Authority officials were joined at the ground breaking by federal and state elected officials who support the partnership initiative.KSC and Marshall Space Flight Center directors and managers, along with representatives from Spaceport Florida Authority, Rush Construction, Inc. and the State of Florida break new ground together Dec. 18 on KSCs Reusable Launch Vehicle Support Complex.The Employee of the Year is a new NASA award at KSC. Every October, co-workers within each directorate will select one awardee from among the previous fiscal years employees of the month. Each employee of the year will receive a monetary award and a choice of special tour options.Employees of the year for 1998 are, left to right, Robert Preston, Safety and Mission Assurance; Mike Canicatti, Installation Operations; Terry Taylor, Public Affairs; Frank Villalpando, Space Station Hardware Integration Office; Avis Upton, Shuttle Processing; Robert Ashley, Space Station and Shuttle Payloads; Gladys Escobar, Procurement; Elisa Atrusa, Checkout and Launch Control System; Denise De La Pascua, Biomedical Office; Henry Collier, Office of the Chief Financial Officer; Lori Weller, Joint Performance Management Office; and Robert Page, Launch Integration Office. Not shown are Suzie Stuckey, Office of the Chief Counsel; Doretha Worthy, Administration Office; Bill Roy, Logistics Operations; and Maria Littlefield, Engineering Development. January employees of the month are, left to right, Hong Le, Checkout and Launch Control System Office; Rita Long, Office of the Chief Financial Officer; Len Nicholson, Logistics Operations; Susan Hutchinson, Safety and Mission Assurance; Suzie Cunningham, Advanced Development and Shuttle Upgrades; Dr. Philip Scarpa, Biomedical Office; Cheryl Johnson, Administration Office; Robert Franco, Space Station and Shuttle Payloads; John Weeks, Space Station Hardware Integration Office; Delores Green, Installation Operations; and Larry Hand Jr., Engineering Development. Not shown are Jessie Clarke, Office of the Chief Counsel; Kenneth Nowak, Shuttle Processing; and Mary Conklin, Payload Processing. John F. Kennedy Space Center Managing editor. . . . . . . . . . . . . . . . . Bruce Buckingham Editor. . . . . . . . . . . . . . . . . . . . . . . Susan Maurer Editorial support provided by Information Dynamics Inc. Writers Group. NASA at KSC is on the Internet at http://www.ksc.nasa.gov USGPO: 733-112/80022Spaceport News Spaceport News is an official publication of the Kennedy Space Center and is published on alternate Fridays by the Public Affairs Office in the interest of KSC civil service and contractor employees. Contributions are welcome and should be submitted two weeks before publication to the Media Services Branch, AB-F1. E-mail submissions can be sent to Susan.Maurer-1@ksc.nasa.gov SPACEPORT NEWSJanuary 8, 1999 Page 6 Mars Polar Lander launches successfully The Mars Surveyer Polar Lander launched successfully through a thin layer of clouds from Cape Canaveral Air Stations Launch Pad 17B on Jan. 3 at 3:21 p.m. on a Boeing Delta II rocket. The Mars Surveyor project continues the program of Mars exploration begun by NASA in 1996 with the launches of the Mars Global Surveyor and Mars Pathfinder spacecraft. Together, the Climate Orbiter and the Polar Lander will study the density and distribution of volatile materials in the Martian subsurface and atmosphere to learn more about the history of Mars climate.The Polar Lander is scheduled to arrive on Mars in December 1999. Like Pathfinder, the Lander will dive directly into the Martian atmosphere, using an aeroshell and parachute to slow its initial descent.The Mars Polar Lander lifted off from Cape Canaveral Air Stations Launch Pad 17B on Jan. 3 at 3:21 p.m. The Polar Lander will join the Mars Climate Orbiter, launched on Dec. 11, 1998, at Mars at the end of this year to provide information to NASA scientists about the Martian subsurface and atmosphere.Review ...(Continued from Page 5)additional test flights during a 12month period beginning immediately after the initial contract is complete. Once the X-34 has demonstrated safe and reliable performance at White Sands in New Mexico, the project will be moved to KSC for a significant number of test flights. Mars exploration The Mars Climate Orbiter launched from Cape Canaveral Air Station Dec. 11, followed by the Mars Polar Lander Jan. 3. Together, these spacecraft will contribute to NASAs scientific goals of observing the Martian climate to look for hints that primitive life may have existed during Mars early history. Also, two Mars environmental chambers one in the Operations and Checkout Building and a prototype lab behind the Launch Equipment Test Facility are under development. They will simulate Mars atmospheric pressure and constituency, dust and thermal environment. Contracts and facilities In August, Space Gateway Support of Herndon, Va., was selected for award of a government contract to perform base operations for KSC and the U.S. Air Forces 45th Space Wing, including Cape Canaveral Air Station and Patrick Air Force Base. To save money, reinvest savings and consolidate functions with the objective of remaining competitive in a global launch market, this new Joint Base Operations Support Contract will save the government a substantial sum during the years of the contract. The cost-plus award fee contract features a five-year basic performance period that began Oct. 1. KSCs Space Shuttle Main Engine Processing Facility opened July 6. A major addition to the existing Orbiter Processing Facility bay 3, the new facility replaced the Shuttle Main Engine Shop located in the Vehicle Assembly Building. KSC and Spaceport Florida Authority agreed to begin plans to construct a $15-million facility on KSC property to function as a research laboratory. The new facility will consolidate life sciences research activities and replace the old Hangar L facility. Finally in 1998, KSC was designated the lead center for NASA Acquisition Pollution Prevention, established to reduce or eliminate hazardous shared materials and volatile organic chemical uses from the design, production and operation in NASA programs. Tourist destination upgrades Two new tourist destinations opened Jan. 16 to draw visitors into the heart of Shuttle launch operations and offer a close-up look at preparations for on-orbit construction of the International Space Station. The Launch Complex 39 Observation Gantry is located halfway between the Vehicle Assembly Building and the Shuttle launch pads. The International Space Station Center is located adjacent to the Space Station Processing Facility and features a viewing window into the ISS payload processing bay. Community outreach KSCs contributions through the 1998 Combined Federal Campaign exceeded its goal by nine percent, with more than $228,736 given. In conjunction with National Engineering Week, Feb. 22-28, KSC hosted about 100 local middle school students for NASA Engineering Day activities on Feb. 9. Through NASAs Mission to Americas Remarkable Students educational outreach program, students from around the state and across the nation participated in various science experiments carried into space aboard the Space Shuttle. The first Partners in Education and Research Conference to be hosted by KSC was held, and in March 1999, KSC will host a robotics competition sponsored by For Inspiration and Recognition of Science and Technology, or FIRST. The event should draw hundreds of competitors and thousands of spectators. It is the first regional competition for the organization to be held in the southeastern United States. Also, the centers new multipurpose display won several awards in 1998, while representing KSC in state, regional and national events, showcasing the KSC Center of Excellence while educating the public and KSC customers as well.